Lately, the Lord has been quietly telling me it’s time to simplify my life – my home, my heart, all of it – so that’s what I’m going to explore over these next 31 days. This will be an experiment in decluttering all the rooms and closets, nooks and crannies of my entire life so I can ultimately live more freely (hence the photo of my niece cartwheeling on the beach! ), focused on what’s truly important. I’ll be covering all kinds of topics, from simplifying my wardrobe to my finances to my expectations of myself. I would love for you to follow along, and learn to live a simpler and more intentional life with me. 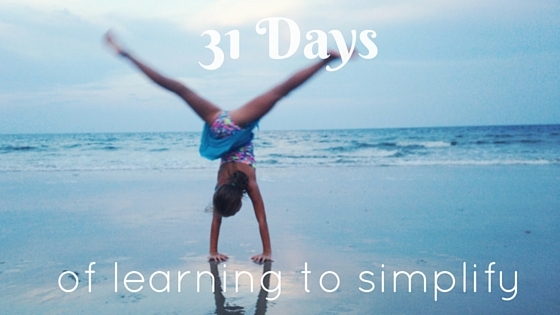 Next Article 31 Days of Learning to Simplify: But why?